SDM-CAN Helper is a free, add-on program for Campbell Scientific's RTDAQ Real-Time Data Acquisition Software. This add-on program walks users through the process of configuring their SDM-CAN device(s), connecting the SDM-CAN device to the data logger, sending an appropriate program to the data logger, and setting up that data logger to collect specific values from the CANbus network. Users must have a valid installation of RTDAQ on their computer to install the SDM-CAN Helper program. To download SDM-CAN Helper, refer to the Downloads section of the web page. 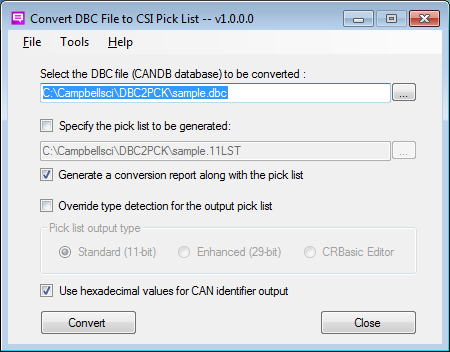 A utility program called "DBC2PCK" that converts industry standard ".DBC" files to a pick list format usable by Campbell Scientific Software. The .DBC contains critical information about the data that can be digitally captured from the CAN network of a vehicle or other system. An RTMC Project containing multiple screens that step the user through the process of configuring the SDM-CAN device, connecting it to their data logger, sending the right kind of program to the data logger, and setting up the configuration to read values from the CAN network and store them in data logger memory. Settings in the SDM-CAN device can be checked and changed without having to use the diagnostic port. There are screens for checking for received CAN messages and transmitting specific messages onto the CAN network. Testing or checking of SDM-CAN decoding parameters can be tested from the Helper without having to manually generate a new program for every iteration. There are screens for assisting users with the math for CAN identifiers, data types, and start bits. Also included are "Pick List Tester" screens for the testing of signals in SDM-CAN pick lists. The "click-on hotspot" boxes with green text take the user to a specific RTMC screen for performing the listed operation. Red items in white boxes can be changed. However, red items in white boxes require an execution of the "Execute Program Changes" button to take effect. These items are tied to the data type constants in the SDMCAN() instructions in the Helper data logger program. The accumulated pending program changes are tracked and can be applied by clicking on the "Execute Program Changes" button at any time. Changes can be discarded by clicking on the "Discard Changes" button. Blue items in white boxes can be changed and take effect in real-time. They do not require pressing the "Apply Changes" button to become effective. Boxed items with grey background boxes are "view only" items. The "RxOnly Message" screen can be used for checking broadcast messages. The "TxRx Message" screen can be used to check/test request response type messaging. Specific protocol versions of these screens are J2190, J1979 PID's, and J1939-71 SPNs. There is also a real-time view screen of the CAN Rx data frame that is useful for troubleshooting bit data. The "Test Pick List" screens allow pick lists to be downloaded to the data logger's CPU memory. Signal items in these pick lists can be tested manually, one at a time. The "Automated Mode" option automatically tests each pick list item and writes the results into a tested pick list file in the data logger CPU memory. Add-on package for RTDAQ. Assists users of the SDM-CAN device. See the SDM-CAN Helper Overview for more information about this product. Note: The SDM-CAN Helper will only be installed if a valid installation of RTDAQ already exists on the computer.